This post was originally published on August 25, 2010 on the occasion of Satoshi Kon’s death and is reprinted below in advance of the Modern Art Museum of Fort Worth’s Story, Style, and Character: The Art of Japanese Animation, which begins with Paprika on Friday at 10pm. 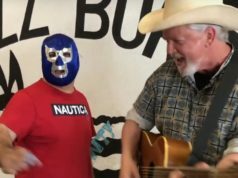 After his death, the filmmaker left a moving farewell to his fans on his website, an English translation of which is available here. Sad news from Japan: Animated film director Satoshi Kon has died of pancreatic cancer at age 47. At first it appeared that the news was some cruel Internet hoax, but his animation studio has confirmed his death. Many great artists die with their best work decades behind them, but it’s especially sad when a great artist dies in glorious mid-career, the work still vital and innovative and keeping us guessing as to what will come next. I saw three of his films, and two of them made my lists of the best movies of 2003 and 2007. What made Satoshi Kon so special? He was one of the few anime directors whose work was recognized by mainstream critics. His movies borrowed some elements from the candy-colored fantasies of Hayao Miyazaki and the convulsive apocalyptic fare of Katsuhiro Ôtomo, but he developed a visually lush style all his own. His films frequently commented on the dreamlike nature of cinema (I wonder whether he got to see Inception), making profound statements about memory and the way movies shape our thought processes. 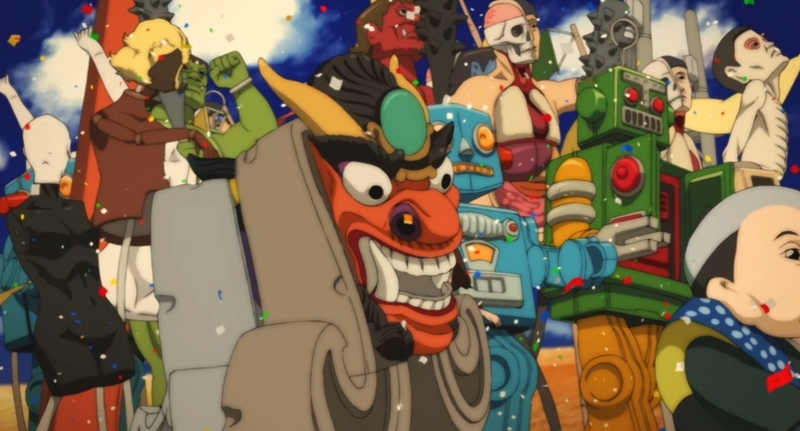 Yet for all the sophistication of their storytelling, his movies had visceral power, too: Check the parade of toys that threatens to consume the world in Paprika. It’s so cute, and yet it’s also terrifying and demented. Looking for something of his to rent on Netflix? My personal favorite of his movies is Millennium Actress, one of the most meta films ever made. 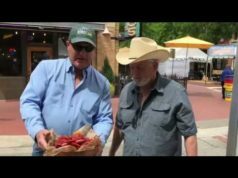 (The film’s website is no longer online, but here’s the trailer.) It’s about a reclusive former movie star who grants a rare interview with a documentary film crew to talk about her life. 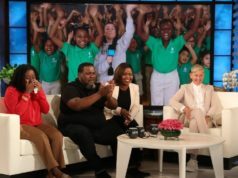 Not surprisingly, there are flashback sequences as she describes her childhood and her first film roles, but then the documentary director and cameraman find themselves transported into those sequences in her movies, dodging arrows in samurai epics and explosions in World War II flicks. 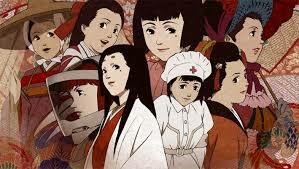 Back in 2004 when I saw Millennium Actress, the complicated structure reminded me a lot of Being John Malkovich‘s. The actress’ life and her movies melt into each other, but it’s all surprisingly easy to follow. Her passing encounter with a painter early in her life shapes her life, and though the revelation of his fate is pretty shattering, the film shows her whole life’s work as motivated by this one incident. Life isn’t about getting or not getting what you want, it’s about what happens to you as you chase after your dream. The actress’ death is represented by a scene from a sci-fi movie that she made, with her portraying an astronaut blasting off into the unknown. It’s beautiful and poetic. The movie also has a cheeky cameo appearance by Godzilla. 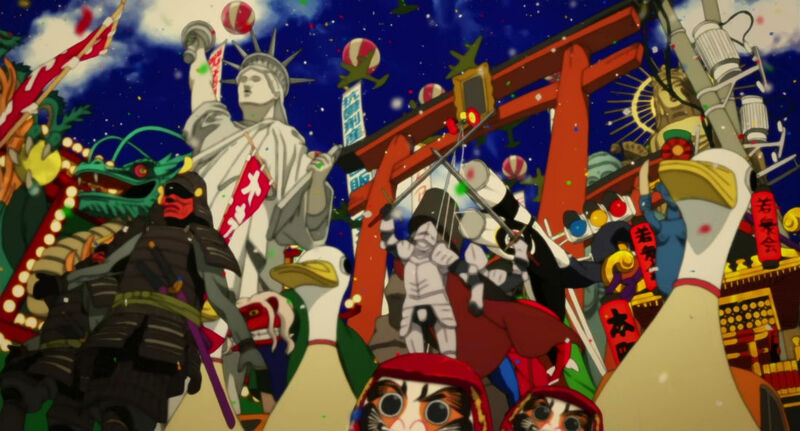 Kon’s 2004 dramedy Tokyo Godfathers is his most conventional film, and I find it to be his least interesting one as well, but if you’re not feeling adventurous and want to ease your way into his body of work, it might make a good starting place. It’s about three homeless people who find a newborn baby alive and abandoned in a dumpster. They spend Christmas trying to track down the baby’s mother. The story is simple and well told, with a couple of happy coincidences that come off as gentle miracles rather than plot contrivances. If you’re looking for a Christmas movie that’s off the beaten path, it’s a good choice for that as well. 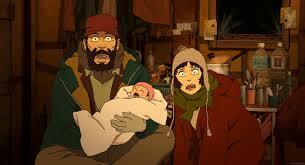 The homeless heroes of “Tokyo Godfathers” try to get this baby somewhere safe for Christmas. The last film of Kon’s that we’ve seen was Paprika, which I actually did a short write-up for when it played at the Modern three summers ago. It’s about a psychotherapy machine that allows therapists to enter their patients’ dreams, only the tech falls into the wrong hands, with the result that everybody’s dreams threaten to destroy reality. This movie has a crazed vibe that the other two don’t have, but what’s just as interesting as the cuteness apocalypse is one of the heroes of the story, a jaded cop who turns out to know much more about film theory and technique than most police officers do. It turns out he’s haunted by the memory of his best friend in college, an aspiring filmmaker who died prematurely. (Did Kon presage his own fate here? That’s an eerie thought.) The movie’s a frenetic series of close escapes and mind-blowing hallucinations, but the part that sticks with me most is the quiet ending, with the cop finding a new sense of peace by going to a movie theater and buying a ticket. This artist’s wild imagination and creativity came packaged with humanity and wisdom. Kon knew very well that our movies live on after we’re gone. That’s a comforting thought now.